It’s a new (ish) year, and with several months of warm, sunny (ish) weather ahead of us we thought it is the perfect time to reevaluate our landscape photography. It’s quite easy to fall into routines, visit the same places and find yourself taking the same pictures. So in the post below we’ll show you how a little bit of effort on your part can go an awfully long way when it comes to capturing stunning landscape photography. No more driving to the local scenic spots during your lunch break, parking in the car park and walking 20 paces or so to lazily shoot the same old view that every other visitor to the site does. We’ll reveal the benefits of getting up at dawn to shoot sunrise scenes, making the effort to trek up mountains for better views, and the joys of seeking out bluebells in a forest, lone trees in fields and surging waterfalls. We’ll also help you frame shots better, with tips on adding foreground interest and composing arty abstract shots. Plus we’ll teach you new camera skills to set the right shutter speeds for milky waters in your coastal shots, how to take total control of depth of field and focusing, and how to best use telephoto lenses to isolate interesting sections in your scenes. So, prepare to make an effort… as, when it comes to landscape photography, you will only ever get out what you put in (for more ideas, also check out our 10 Commandments of Landscape Photography – and how to break them). A common mistake beginners make is to only photograph landscapes in the middle of a sunny day. It’s much better to set that alarm clock and get to your location before sun up. Before, during and just after sunrise are great times to shoot landscapes as the sun is lower in the sky, which means softer, warmer light across your scenes, and more colour in the skies. This lower angle of sunlight also creates longer shadows, so you see the relief of the landscape, adding more depth to your shots. Use a tripod as light will be low, so shutter speeds will need to be slow (see our 4 tips for sharper shots when using a tripod). Wherever you live, the weather can be a pain in the proverbial. However, don’t put your camera away simply because the clouds have gathered or there’s a storm brewing. A skyscape full of clouds can add much more drama to your shots than a block of blue sky. So get out there, be patient, take your time, and wait for a break in the weather to highlight the focal point in your scene and to bring life to your landscape shots. You’ll be surprised on how many occasions that seemingly dull, grey days offer fleeting golden moments (or, alternatively, find out How to replace boring skies in Photoshop). We’ve all done it – driven to a beautiful location deep in the countryside, only to pull over by the side of the road to step out and lazily take a shot (or worse still, shoot from the car window!). You won’t get great shots like that. Instead, pop on your hiking boots, prepare a packed lunch and get your camera gear on your back, then trek up to the beauty spots far from the car parks. Being higher up will create better opportunities for capturing stunning vistas, with far more interesting mountain scenery than down below with the coach tours (for more inspiration, see our 79 travel photography tips you shouldn’t leave home without). The classic, artistic landscape shot is the ‘single tree in a field’. It’s simple yet striking, and the great thing is, there is bound to be a lovely lone tree in field within driving distance of your home (see our 10 tips for more creative pictures of lone trees). Aim for a clean composition – the tree needs to be far enough away from distracting wooden fences, hedgerows or stone walls – and ideally positioned in the top corner, with fields full of colourful crops or flowers in the foreground and surrounds. Once found, return at different seasons to take shots with a completely different light, colour and feel. A great way of adding dramatic tension to your landscape shots is to find a gushing waterfall in an already-beautiful scene (find out How to set up your DSLR to shoot moving water). To capture the power and motion of the waterfall you’ll need to use a long exposure, anything from two to 20 seconds, and also your tripod to ensure there’s no camera shake. You’ll need to shoot in low light – near sunrise or sunset – to be able to correctly expose your shot with a slow shutter speed. If you have to shoot in broad daylight, you can attach a neutral density filter to your lens so you can use a slower shutter speed. Early in the year, what better way to say ‘spring is here’ than with a wonderful photo of blossoming bluebells. Go hunting in your local forests or speak to fellow photographers, local hikers or dog walkers to see if they’ve spotted any bluebells in the woods. You’ll have to time it right, as there’s only a small window of opportunity (around two weeks, usually in May) to get a great shot when the bluebells are in full flower. Try and get creative with your compositions so the blocks of bluebells are the main focal point in your frame. Don’t think your landscape shots have to always be of big, sweeping hillsides with vast skies. Instead look for interesting elements within the landscape, such as areas of colour, pattern, shape and texture. Rows and lines can also work well to lead people into your shots. Use a telephoto zoom lens (try a focal length of around 200-300mm) to pick out and home in on the interesting detail to create an artistic abstract image. The biggest compositional mistake with landscapes is to frame up the scene with a huge area of empty, boring foreground (see our 10 rules of photo composition – and why they work). To avoid lacklustre landscape shots and improve your results significantly you must compose your shots to include some sort of foreground interest, whenever you use a wide-angle lens. Get down low to avoid too much empty middle ground in your frame, then point your lenses down slightly to include rocks, stone walls or foliage in the foreground to lead people into your scene. A simple way to improve your landscape compositions is to avoid always placing the main focal point of your scene and the horizon across the middle of your frame. For most landscapes, a mix of two parts land to one part sky is ideal. But with the right sky, placing the horizon a third of the way up the frame also works; this gives your shots breathing space and also enables you to take advantage of beautiful cloud formations and colours in the sky. Vertical compositions work well here too. However, if the sky is boring, don’t be afraid of framing your landscape shots so there’s no sky in them at all. It’s good practice, when shooting landscapes, to use a narrow aperture to ensure your scenes are sharp from foreground to horizon, but it’s also crucial to focus accurately. If you focus on the foreground, your horizon won’t be sharp enough, and vice versa; if you focus on your horizon, the foreground will be soft. The easiest way is to use a single AF point and focus one-third ‘up your frame’ to ensure your shots are acceptably sharp from front to back. Shooting seascapes at sunset can be hugely rewarding to capture on camera. 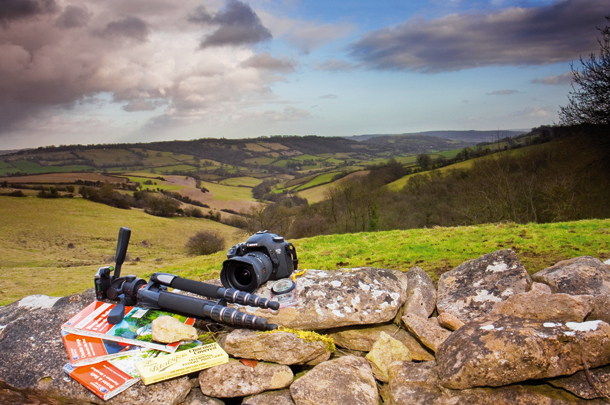 The trick is to take your wide-angle lens and tripod (and wellies to keep your feet dry!) and to arrive on location an hour before sunset to capture the changing light and colours (see 25 great examples of serene seascapes). At this time of day the light levels will be low enough to use a narrow aperture (around f/16 or f/22) so you can get slow enough shutter speeds (around 10-30 secs) to capture the movement of milky waters (for more ideas, see our 10 tips for better coastal landscapes). Shooting landscapes isn’t all about using a wide-angle lens to capture the biggest scene you can fit into your frame. A great way of focusing on the main points of interest is to use a telephoto zoom lens with a long-end focal length of around 200mm. A telephoto lens not only enables you to isolate main points of interest in a landscape, whether a row of trees or bridge over a snaking river, it also compresses perspective to bring objects closer together for a different angle of view compared to a closer, wide-angle shot (to learn more about your telephoto, check out our guide to Your lens markings explained). The post 12 promises every landscape photographer should make appeared first on Digital Camera World.